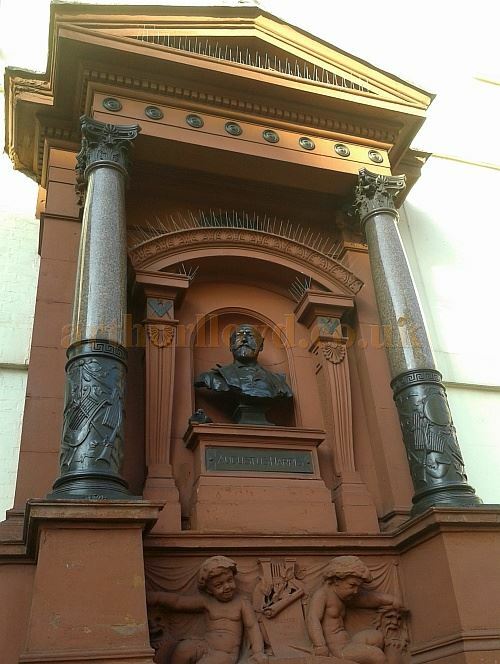 Above - The Augustus Harris Memorial Fountain at the Theatre Royal, Drury Lane in September 2014 - Photo M.L. There was a large muster of the public on Monday afternoon about the precincts of Old Drury to witness the formal unveiling, by the Lord Mayor, of the drinking fountain erected to the memory of the late Sir Augustus Harris. Unfortunately the arrangements were very defective, and the many thousands present could obtain little or no view of the proceedings. The angle of Catherine Street and Russell. Street, where the memorial is, in a niche of the theatre facade, is no doubt a difficult one from the point of view of traffic, but the public need not, with proper regulation, have been disappointed as largely as they were. And if the public could not see, the members of the profession, in which the late entrepreneur made as conspicuous and masterful a figure were not in anything lace representative numbers there to see. The absence of some of the closest workers with Sir Augustus was especially noticeable, and, whatever the circumstance was much to be regretted. The temporary platform and the enclosed area before the fountain contained only scanty groups of spectators, though a few well known faces were to be observed. Right - The memorial fountain to Augustus Harris, erected outside the front of the Theatre Royal, Drury Lane after his death - From the book 'The Theatre Royal Drury Lane' by W. Macqueen Pope 1945. 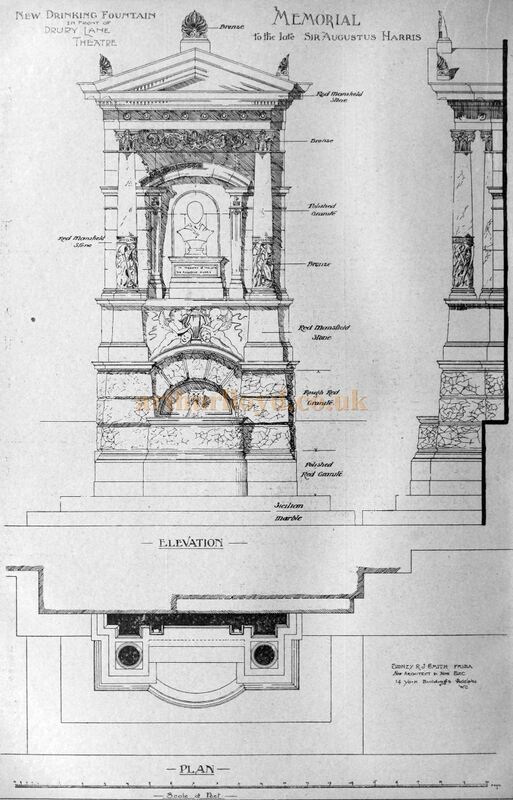 Above - A Sketch and Plans for The Augustus Harris Memorial Fountain at the Theatre Royal, Drury Lane - From the Building News and Engineering Journal May 14th 1897. Caption Reads:- 'The memorial fountain to the memory of the late Sir Augustus Harris is now being erected on ground in the front of Drury-lane Theatre, kindly and graciously given by His Grace the Duke of Bedford. The materials are polished granite and rough granite. The masons' work is being carried out by Messrs. Higgs and Hill, and the bust will be executed by Mr. T. Brock, R.A. The cost of the work is being defrayed by public subscription, some £2,000 having been collected, and £1,000 of which is being given to Charing Cross Hospital for a bed for the dramatic, musical, and variety professions. The New River Co. have kindly consented to supply the water without charge. The whole work is being carried out from Mr. Sidney R. J. Smith's design, he acting as hon. secretary as well as hon. architect. A large and influential committee (of which H. R. H. the Prince of Wales is patron and Alderman Frank Green hon. treasurer) are carrying out the wishes of the subscribers in the matter. ...The memorial (from the plans of Mr. S. R. G. Smith) is built of red granite and Mansfield stone, with bronze enrichments. The base is of polished Norwegian granite on a Sicilian marble base. The water is delivered by a lion's head into a circular basin. Above the basin and the rusticated granite base is a panel illustrative of dramatic art, having figures carrying masks, and above this panel rises a classic pediment, supported by two polished granite columns, having drums at the base with musical instruments (in bronze) carved on them, while the capitals of the columns are also in bronze. Under the pediment (which has tragedy and comedy masks, and a central lyre on the acroteria blocks) is a niche containing the bust, beautifully modelled and worked in bronze, by Mr. T. Brock, R.A. Over the bust is a frieze crest. &c, while under it (in a panel) is the inscription in bronze, "Augustus Harris." 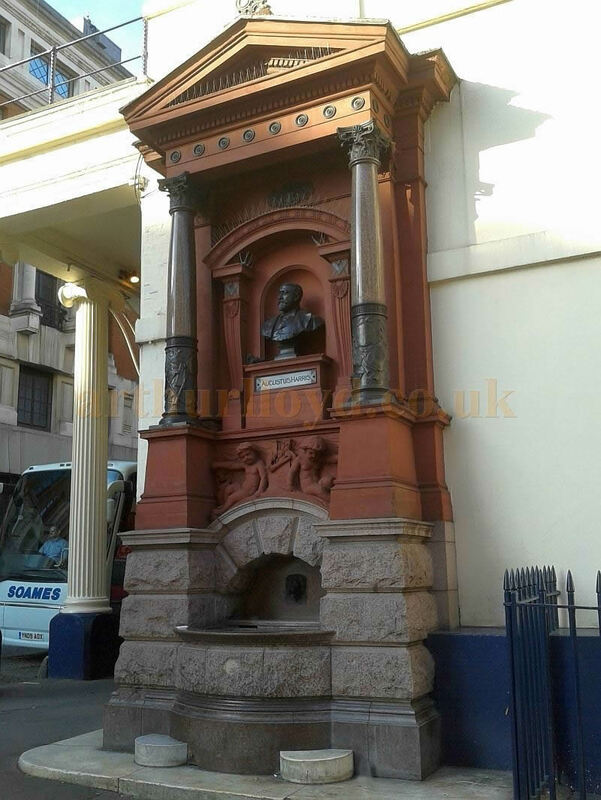 Left - The Augustus Harris Memorial Fountain at the Theatre Royal, Drury Lane in September 2014 - Photo M.L. The Lord Mayor, on his arrival, was received by Mr. Alderman and Sheriff Green (the treasurer)', who presided; Messrs. H. Klein and Sidney R. J. Smith (the hon. secretaries of the fund), and Mr. W. Emden and Mayor Prooyn (representing the Strand Board of Works). 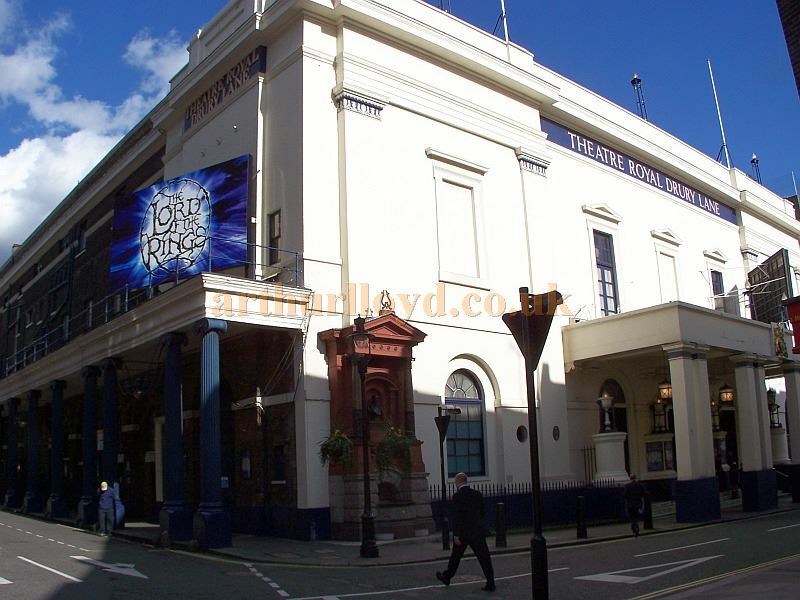 Above - The Theatre Royal, Drury Lane and the Augustus Harris Memorial Fountain during the run of 'Lord of the Rings' in March 2007 - Photo M.L. 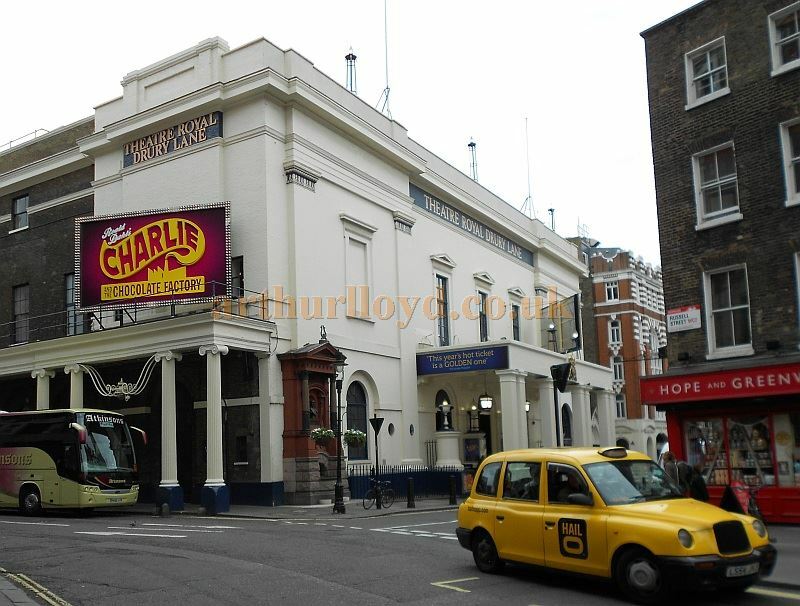 Above - The Theatre Royal, Drury Lane and the Augustus Harris Memorial Fountain during the run of 'Charlie and the Chocolate Factory' in May 2013 - Photo M.L. ...Work done by some men was like a pebble cast into the waters. In time the ripples on the surface passed away, but such a simile could not be assigned to the man whose name was coupled with so many triumphs at Drury Lane. He was an admirable citizen and loyal Englishman, and he had at heart the well being of is fellow-men. The drama had held possession of Drury Lane long before they were born, and it would be in evidence when their generation had passed away; but Sir Augustus Harris had made it what it never was before, and what in all probability it would remain for -many years to come. 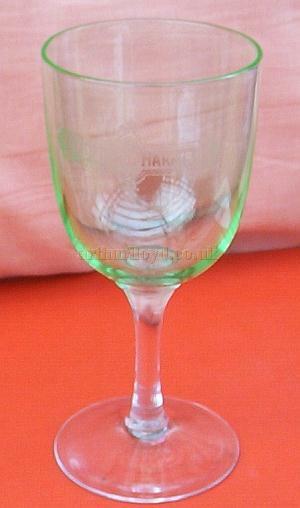 Right - A drinking glass with the words 'Augustus Harris' engraved on the bowl - Courtesy Ruth Allison. After the Lord Mayor's address, Messrs. Smith and Klein thanked his lordship for unveiling the memorial. The Lord Mayor, in response, added a few words, in which he paid a tribute to the faithful manner in which Sir Augustus Harris had discharged his civic duties in connection with the City of London. The above article was first published in the Stage Newspaper, November 4th, 1897. A visitor to the site, Ruth Allison, has recently sent in this photograph of a glass in her possession which has the words August Harris engraved on the bowl. Although I have never seen a mention of this glass before it is my assumption that it was probably one of several made to toast Augustus Harris on the unveiling of his memorial fountain outside the Theatre. If you have any more information about this glass please Contact me.